with the most shocking twist you won't see coming. . .
"Amazing. TORE through it!" Holly Seddon, bestselling author of Try Not To Breathe. If you liked APPLE TREE YARD, you will LOVE this gripping novel. Is Heidi mad? Or is Jason hiding something? And can their fragile marriage survive Heidi's search for the truth . . . Thoroughly enjoyed this debut novel. A real page turner. My only problem with it was the ending. Very well written and I will be looking for more books from this author. A wonderful debut, fast-paced and mysterious! Currently #8 on Kobo's Mystery & Suspense Charts, My Husband's Son is the debut novel by author Deborah O'Connor. 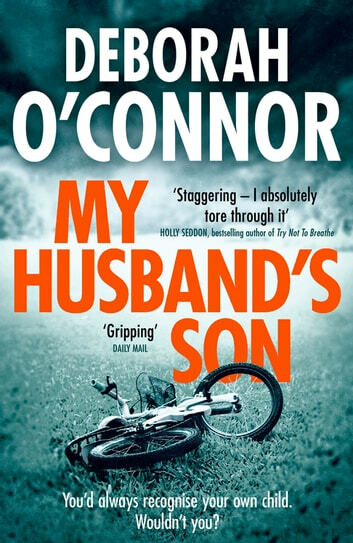 Following in the footsteps of recent popular thrillers, My Husband's Son focuses on a family mystery, luring readers with talk of a "devastating twist". When the twist is mentioned before the start of the book, you better believe it's going to be a good one (and it is). Having read other recent books which aim to ride on the coattails of Gone Girl and don't quite deliver, this one is a nice surprise. My Husband's Son is about Heidi and her husband, Jason. After learning that Heidi's own daughter was murdered six years earlier, her increasingly distraught actions throughout the book become more believable. Heidi and Jason were brought together by mutual tragedy; the loss of Heidi's daughter, and the disappearance of Jason's son. The story opens with Heidi spotting a boy that she recognises immediately as her husband's son, Barney, but to her surprise, Jason quickly nixes the idea, adamant that it isn't him. And he would know, wouldn't he? I was surprised to learn that this is a debut novel as, compared to other debuts I have read recently, the characters, structure, plot and settings are all written very tightly. My only complaint was that toward the end of the novel I became tired with some of Heidi's actions and, although I found them reasonably believable for someone in her situation, I felt that some things were a little too obvious for her to fall for them. All in all this is an enjoyable fast paced read, perfect for fans of the psychological thriller genre, and an excellent debut novel. I'm looking forward to seeing what this author creates next. Very heartrending story of a missing boy and a murdered girl. The father of the boy and the mother of the girl get married and all sorts of issues arise when the wife believes she has found her husband's son. An intriguing plot which leaves the reader wondering what she would do is confronted with the dilemma that eventuates. Food for thought. Very good read. Full of suspense. Characters very well drawn.It is a hard book to put down. The short chapters make for easy reading.